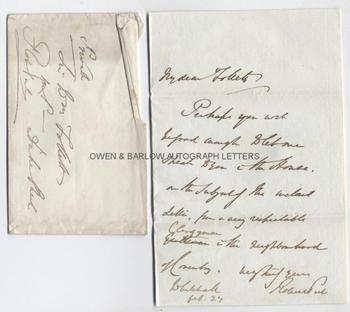 SIR ROBERT PEEL AUTOGRAPH LETTER SIGNED. British statesman and twice Prime Minister (1834-5 and 1841-46). ALS. 1p and integral blank leaf. Whitehall. February 27th [no year but circa 1838]. With original autograph envelope marked "Private" and also signed by Peel with his black wax seal on verso with impression of his heraldic arms. To Sir William [Webb] Follett. "Perhaps you will be good enough to let me speak to you in the House on the subject of the enclosed letter from a very respectable clergyman in the neighbourhood of Coventry." 8vo. Approx 7 x 4.75 inches. All edges gilt. Paper watermarked 1838. The envelope is a little creased but the letter is very fine. Sir Robert Peel was a very successful Prime Minister. He established the modern police force (known colloquially as "Peelers" or "Bobbies"), formed the Conservative Party out of the splintered remains of the old "Tory" party and, in his second term as Prime Minister, he repealed the Corn Laws. He had served as Home Secretary under Lord Liverpool and took the role of Chancellor of the Exchequer whilst also serving as Prime Minister. This letter is to Sir William Follett, who was M.P. for Exeter and served as Solicitor-General in both of Peel's administrations.